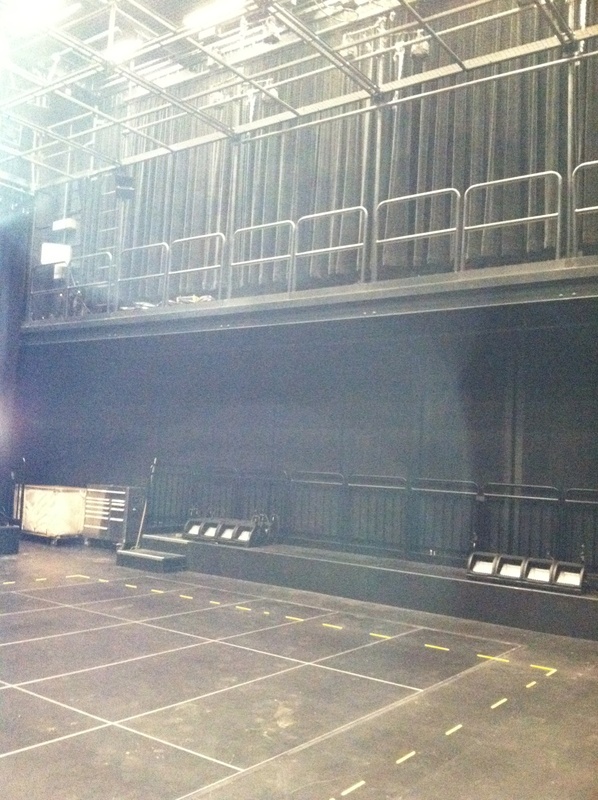 The Eva Marie Saint Theatre consists of a stage that is surrounded by audience members and has lifting capabilities. Photo by Kelsey Rentner. “Arabian Nights” will be the first show performed at the Wolfe Center for the Arts. This production will take place in February in the Eva Marie Saint Theatre, one of two theaters in the $42 million Wolfe Center. The Eva Marie Saint Theatre, the smaller of the two theaters, is named after BGSU alumnus and Oscar-winning actress Eva Marie Saint. The Eva Marie Saint Theater, also known as the “black box” theater, holds up to 120 people. 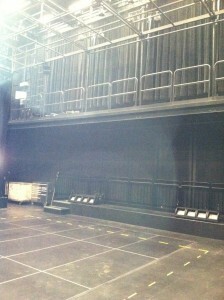 The seating arrangement forms a square around a stage placed in the middle. The stage also has the ability to lift, giving unique angles for the audience to view performances. BGSU’s production of “Arabian Nights” choreographed the show for this theater setting. The play will reenact several of the 1,001 stories told in the original play. Some students who are performing in “Arabian Nights” said the size of the stage and unique seating arrangement presents some challenges. The larger of the two theaters in the 93,000-square-foot Wolfe Center for the Arts is named the Thomas B. and Kathleen M. Donnell Theatre. This theater hosts two stories of seating, a third story for audio and technical equipment, orchestra lifts and prop-flying capabilities. “This is the most expensive room in the building because of all that is going on in this theater,” said project manager Ryan Miller. Productions of “Hercules” and “Chicago” will be performed this semester in the Donnell Theatre. The Norwegian architectural firm, Snøhetta, designed the Wolfe Center for the Arts. This architectural firm also created the 9/11 memorial in New York City, according to the article, “Wolfe Center architect describes the ‘power of place’” on bgsu.edu. BGSU students involved in the production of “Arabian Nights” said they are eager and excited to be involved in the very first production in the Wolfe Center. “Arabian Nights” will be performed Feb. 16-18 and 23-25 at 8 p.m. and Feb. 19 and 26 at 2 p.m. Tickets are $12 for adults and $9 for students and senior citizens and can be purchased at the box office in the lobby of the Wolfe Center. This entry was posted on Tuesday, January 31st, 2012 at 8:13 pm	and is filed under About Us, BGSU, Spring 2012, Student Contributor, Wolfe Center. You can follow any responses to this entry through the RSS 2.0 feed. Both comments and pings are currently closed.